Kidney stones are also known as Calculi or Renal Stones. These stones are actually crystalline and hard minerals that are created inside Urinary tract or Kidneys. 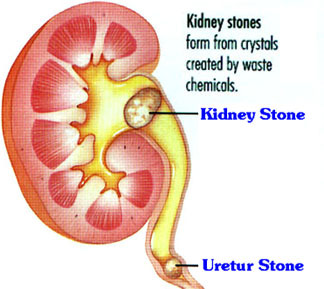 Even very smaller sized stones can damage tissues of kidney creating infection. The main function of Kidneys is to remove waste materials from blood and throw them into the urine to be excreted from human body. Sometimes these waste materials are not properly dissolved in the urine that causes the formation of stones in the kidney or urinary tract. What are Common Types of Kidney Stones? Calcium Kidney Stones: Most common type is Calcium stones which is caused by excess of Calcium in urine. More common in men. Uric Acid Kidney Stones: These are more common in women and are mainly caused by severe dehydration or in condition where Uric Acid level is increased in blood (for example in Gout disease). Cystine Kidney Stones: These are not so common and are usually formed in people that suffer from a Genetic Disorder called Cystinuria. These stones are most difficult to treat and most of the time are diagnosed during childhood. Struvite Kidney Stones: These type of stones are more common in women and are usually larger in size. The main reason of their cause is infection in Urinary tract. What Are Common Symptoms of Kidney Stones? How Treatment of Kidney Stones is Done in Homeopathy? In homeopathy effective treatment of Kidney stones in available. In 95% of cases Kidney stones are removed without surgery or operation. This is the main benefit of this treatment. The homeopathic medicines work by breaking the kidney stones into very small pieces that are then dissolved in the urine to be excreted out. Medicines are used to eliminate the infection that had caused by kidney stones. Homeopathic medicines also stop the re-formation of kidney stones and prevent infection in urinary tract and kidneys. In some cases (about 5% cases) the stones are very large and cannot be eliminated by homeopathic medicines. In such cases Surgery or Operation is recommended. After operation the homeopathic medicines are given again to prevent re-formation of kidney stones. how long could be this treatment to remove this kidney stone? can this kind of cure the treatment will be effected. Kidney stones can be removed by homeopathic medicines. The time required depends on number of stones, size of stones, and location of stones. Smaller and minor stones can be removed within few weeks. Larger and multiple stones may take more or less 1-3 months depending on the condition. For exact time frame, you should contact us and discuss your specific problem. We will study your case and will give you estimated time frame for kidney stones cure. I Have a kidney stone in my left kidney size 3mm.I want to take homeo medicine ,i read your articals i hope you your medicine will releaf me from this pain.kindly tell me your clinic address and timing . You are welcome. Please call on this number to contact Dr. Sabeel: 0300-5125394. Complete clinic Address is: Al-Fatah Plaza, Opposite Punja­b Bank, Chandani Chowk, R­awalpindi, Punjab-46000, Pakistan. You need to contact Dr. Sabeel in order to get help in treatment. Kidney stones can be removed with homeo medicines. My left kidnay is three stones, size are 1.5 to 2 cm, please advise me the medicine or treatment for removal. I am 42 years old, male from Rahim Yar Khan. I am detected with 6mm stone in my right kidney. I sometimes get a burning pain while passing the urine, and the amount of urine is also less than I normally pass. I wonder if it possible to get any help? What do you suggest whether operation or homeopatheic treatment? A.o.a Dr.sabeel sahib, My wife have a kidney stone in her left kidney, size 22 mm. She want to take home medicines , I read ypur articles i hope you, your medicine will releaf me from this pain. many medicines as Eleopathy, Homeopathy. Please till me your clinic addres and timing.